OK, Now I have seen everything. 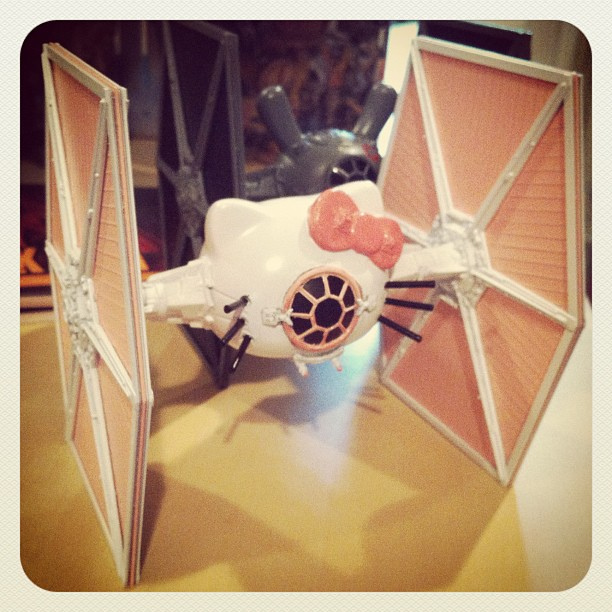 @Sanriobaby – The answer to “Why?” is probably “because G Lucas is every bit as much of a sell-out as Sanrio Corp are”. @Mr HKH – OTOH, perhaps the rebels would have won more easily, because what greater incentive could you give the X-wing pilots to blast “eyeballs” out of the sky than the chance to save the universe and destroy HK at the same time? If you were able to see all these items, you’d make a fortune. Did anyone notice that is a Kidrobot Dunny Tie fighter behind the Hello Kitty one??..! I noticed another variant eyeball sure, but I did not know what it was other than, ah, horny!